During the past three decades, the issue of processing spectral phase has been largely neglected in speech applications. There is no doubt that the interest of speech processing community towards the use of phase information in a big spectrum of speech technologies, from automatic speech and speaker recognition to speech synthesis, from speech enhancement and source separation to speech coding, is constantly increasing. In this paper, we elaborate on why phase was believed to be unimportant in each application. We provide an overview of advancements in phase-aware signal processing with applications to speech, showing that considering phase-aware speech processing can be beneficial in many cases, while it can complement the possible solutions that magnitude-only methods suggest. Our goal is to show that phase-aware signal processing is an important emerging field with high potential in the current speech communication applications. The paper provides an extended and up-to-date bibliography on the topic of phase aware speech processing aiming at providing the necessary background to the interested readers for following the recent advancements in the area. 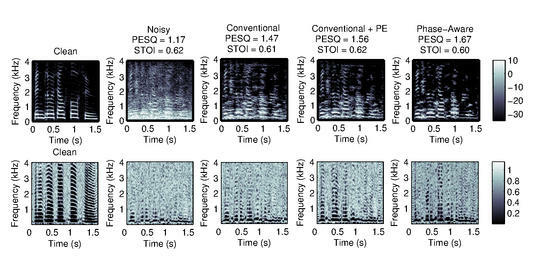 Our review expands the step initiated by our organized special session and exemplifies the usefulness of spectral phase information in a wide range of speech processing applications. Finally, the overview will provide some future work directions. a full overview on the phase-aware speech processing in the literature, as previous and current advances made in the field. exemplifies the usefullness of phase-aware speech processing in several applications including: single-/multi-channel speech enhancement, source separation, automatic speech recognition, speaker recognition, speech coding, digital speech watermarking, speech analysis, and speech synthesis. presents a conclusive overview as a reference for researchers showed interest in the initial special session organized by the authors and continue working towards phase-aware speech processing. The figure shows proof-of-concept simulation results for phase-aware single-channel speech enhancement for a female utterance corrupted in babble noise at SNR of 0 decibels. From left to right results are shown for: clean, noisy, conventional phase-insensitive enhancement (MMSE-LSA), conventional + phase enhancement using MAP phase estimator, and iterative phase-aware amplitude and phase estimator. Results are shown as (top) spectrogram and (bottom) phase variance. Improvements achieved in quality and intelligibility are reported as perceptual evaluation of speech quality (PESQ) and short-time objective intelligibility (STOI). The paper is published in the special issue organized in speech communication Elsevier entitled "Phase-Aware Signal Processing for Speech Communication". The paper showed as the Most Downloaded Speech Communication paper. For more detail see the paper at Speech Communication Elsevier. For further recent works in phase-aware signal processing in speech communication we refer to PhaseLab webpage.